In A Gathering of Wings, Malora leaves the safety of Mount Kheiron for the bush and the bustling city of the Ka in search of Sky, the stallion who used to lead Malora's herd of horses. Accompanied by her closest friends, Malora is faced with making decisions about her future in new ways. Kate Klimo doubles the action and adventure in the sequel to Daughter of the Centaurs! Malora Ironbound, now known as Malora Victorious, has settled into life on Mount Kheiron. The Apex allowed her to choose her hand as a blacksmith and has even given her a permanent residence. A Gathering of Wings sees Malora leaving her new home to hunt the 'Nightmare Demon' that shows her lead horse, Sky, in danger. Within a series, the best feature possible is when the author kicks it up a notch with each installment. Klimo does so and more! 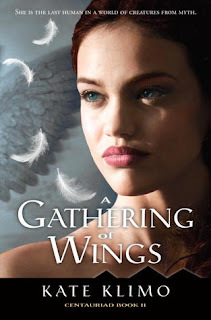 A Gathering of Wings expands Malora's world as she leaves mount Kheiron for the marketplace in Kahiro. While there she and her centaur friends come across a variety of different hibes along with a lead on Sky's whereabouts. Even strands of mythology are highlighted in the fantasy aspects of the story now that readers are introduced to more intriguing creatures. For me, the biggest drawing point for A Gathering of Wings is the burgeoning romance between Malora and the man of her dreams: Lume, the Wonder. It's subtle but Klimo's writing style, which is very expressive, makes it stand out against the fast-paced flow of the story. Lume is one of the few new characters presented, but definitely my favorite next to Malora. He proves himself to be a fierce warrior, angry and with a dry sense of humor. I could fill a page of descriptions for him, but Lume's smooth and protective nature is the most admirable. Don't miss the next stage in Malora's journey. A Gathering of Wings is an exciting addition to the Centauriad series and Klimo has truly outdone herself!